Using only three ingredients, our Buttermilk Biscuits deliver big, buttery, flaky flavor your family will love. As a very young child, my family lived for a time in West Virginia. Among the many dear friends we made there, “Petch” and Wilma McClung were two of our favorites. An older couple with no children of their own, they adopted my parents as their kids and my sister and me as their grandchildren. They lived in a small white farmhouse on several acres of land where they had a garden, raised livestock and kept chickens. Whenever we’d visit, Wilma would use her own fresh ingredients to prepare some of the best meals I’ve ever tasted, including “cat heads with cow salve” as “Petch” called biscuits with butter. So it is no wonder that I have always associated big, flaky biscuits with the taste of home. 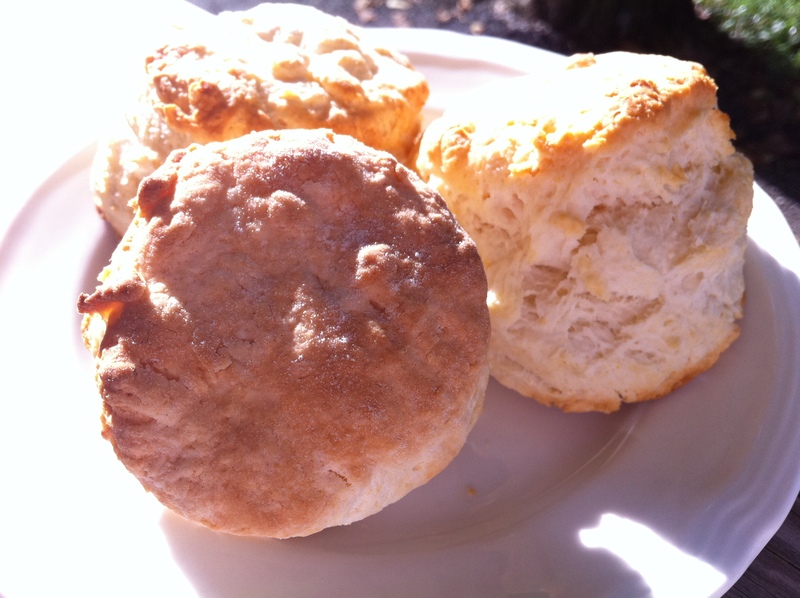 Great with nearly any meal, our buttermilk biscuits will remind you of the ones your own loved ones used to make. Using only three ingredients, our recipe is simple, delicious and keeps the tradition of fresh baked goods alive for a new generation. Cut 1/3 cup of butter into flour with a pastry blender until mixture is crumbly; add buttermilk, stirring until dry ingredients are moistened. Turn dough out onto a lightly floured surface; knead 3 or 4 times. Pat or roll dough to 3/4-inch thickness; cut with a 2 1/2-inch round cutter, and place on a lightly greased baking sheet. Bake at 425°F for 12 to 14 minutes or until golden. Brush with melted butter.